Zany Zebra Classic Slot Guide & Review - Casino Answers! 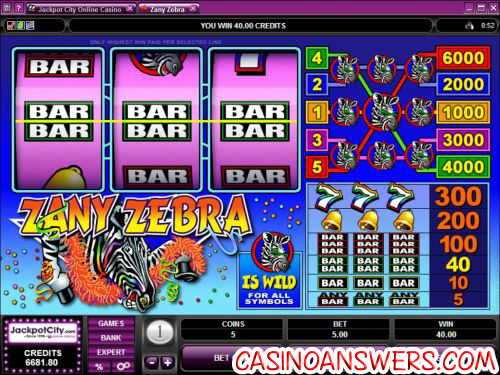 Zany Zebra is a 3-reel, 5-line slot machine with wild symbols from Microgaming. You can play Zany Zebra at Blackjack Ballroom Casino and First Web Casino. Zany Zebra gets its name from the main character – a zebra. But this is not just any zebra. This zebra has a nose ring, sunglasses, a bright orange boa and lots of confetti and streamers. He’s a partying zebra! Zany Zebra is an easy slot machine to play. Coin values on Zany Zebra are $0.25, $0.50, $1, $2 and $5. To start playing Zany Zebra, you need to pick one of these coin values. Once you have a coin value, you need to pick how many coins you wish to play. For each coin, you will activate another payline. The only way to be eligible for the top jackpot on the Zany Zebra slot machine is to play all 5 lines at any coin value. The minimum bet is $0.25 per spin. The maximum bet is $25 per spin. To play all 5 coins, hit the “Bet Max” button. For any other spin using your current settings, hit the “Spin” button. The top jackpot on Zany Zebra is the zebra symbol. 3 of these on the fifth payline, and you can win 6000 coins. The fifth payline is the one that goes from the bottom left to the top right of the reels. On other lines, three zebra symbols will win you 1000, 2000, 3000 or 4000 coins. Betting all 5 coins is the best value in Zany Zebra. Payouts on the Zany Zebra slot machine are as follows: 3 of any bar symbols (5), 3 single bar symbols (10), 3 double bar symbols (40), 3 triple bar symbols (100), 3 bell symbols (200) 3 7 symbols (300), 3 zebra symbols (1000/2000/3000/4000/6000). The zebra symbol is also Zany Zebra’s wild symbol. The wild symbol can substitute for any other symbol to complete a winning combination. This makes the zebra by far the most desired symbol in the game. Switch Zany Zebra over to expert mode and you can turn on its autoplay feature. You can either use the 5X and 10X buttons for quick play or hit “Autoplay” to use advanced settings. You can set the number of autoplay spins (5, 10, 25, 50, 100, 250 or 500), the number of seconds between spins (0, 0.25, 0.50, 0.80 or 1.50), to stop once all spins are complete (default option), to stop when the jackpot is won, to stop if a win exceeds or equals ($25, $50, $100, $250, $500, $1000, $2500), to stop if credits increase by ($25, $50, $100, $250, $500, $1000, $2500) or to stop if credits decrease by ($25, $50, $100, $250, $500, $1000, $2500). You can cancel autoplay at any time. If the game is to slow for you, you can go into the Options menu and turn “QuickSpin” on for faster play. Other options including switching off all sounds, game sounds, win sounds and background sounds. To get 1 hour of free play with $500 to play with to try the Zany Zebra slot machine, sign up now at Blackjack Ballroom Casino! Are US players able to play the Zany Zebra slot? Is there an instant play version of Zany Zebra available? Blackjack Ballroom Casino has a no-download Flash casino as well as the downloadable software. If you have any problems playing the Zany Zebra Flash game in your browser, make sure you have the latest version of Adobe Flash Player installed on your computer. What is a good instant play slot machine?